Aviva Fraud Report 2017: "Crash, Cash and Backlash"
TORONTO, Nov. 23, 2017 /CNW/ - Canadians from coast to coast are deeply concerned about the amount of money that cheaters are draining out of the auto insurance system. They want to fight fraud to lower the premiums paid by honest drivers, a new report finds. "Crash, Cash and Backlash: Aviva Fraud Report 2017" was issued today by Aviva Canada as the first in a series of annual reports on insurance fraud, an issue that plagues honest Canadians everywhere. 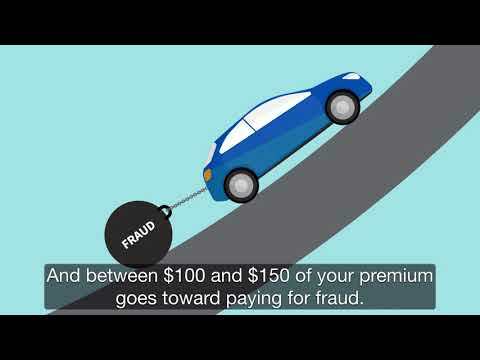 While there is fraud in auto, home and business insurance this report focuses on auto insurance fraud. Fraud is not a victimless crime. Video: Fraud estimates in Canada are as high as $2 billion a year. That's costing you between $100 and $150 a year on your auto insurance premium. Watch this video to learn more. "Honest consumers are paying out of pocket an estimated $2 billion a year in added costs for criminal frauds being perpetrated on the auto insurance system. It's time to fight back. This report shows that Canadians agree with us," said Greg Somerville, President and CEO, Aviva Canada. "Aviva Canada is fighting fraud on behalf of all those honest drivers who are paying higher premiums to fund the fraudulent activities of a small minority of individuals ripping off the system. We asked Canadians what they thought about auto insurance fraud issues, and the message you sent us in our national public opinion poll came across loud and clear," Mr. Somerville added. 81% of Canadians feel that the increase in their insurance premiums is due to fraudulent vehicle repairs, vehicle theft or personal injury claims. 67% feel that cracking down on fraud would reduce their current auto insurance premiums. 77% are supportive of government agencies and law enforcement allocating more time and resources to policing and prosecuting Canadians who have submitted fraudulent claims. 50% of Canadians believe there is too much advertising encouraging people to use personal injury lawyers; meanwhile 60% believe that personal injury lawyers are required in only a "small number of cases." This fraud report outlines what is wrong with the current system. The clear conclusion is that no one can solve this problem on their own. Everyone has a role to play. Insurers need to take a zero tolerance approach to fraud in order to protect honest policy holders. Consumers can avoid being a victim of fraud by recognizing and reporting suspected fraud. The report outlines specific tips for consumers. Provincial governments need to actively partner in the fight against fraud. Provincial regulators should have a clear mandate to work with the insurance industry to fight fraud. More resources need to be dedicated to the investigation and prosecution of fraud. The trend of light consequences needs to be reversed. "Aviva's Fraud Report clearly demonstrates that Canadians believe fraud is a significant and growing problem and much more needs to be done about it," said Ben Kosic, CEO, CANATICS. "Aviva has campaigned to remove fraud from the system for many years. Consumers have told us with certainty that the system is not working in their interests. I agree. They will pay less for insurance if we fight fraud. Let's attack this problem together," concluded Mr. Somerville. The Aviva Fraud Report 2017, produced 100 per cent digitally and paper-free, is available here. The report's survey was conducted by Pollara Strategic Insights through online interviews with 1,502 Canadians from all 10 provinces, conducted in October 2017 and is considered accurate within plus or minus 2.5 percentage points, 19 times out of 20. Aviva Canada Inc. is one of the leading property and casualty insurance groups in the country providing home, automobile, leisure/lifestyle and business insurance to 2.9 million customers. A wholly-owned subsidiary of UK-based Aviva plc, the company has more than 4,000 employees focused on creating a bright and sustainable future for their customers and communities. Aviva Canada invests in positive change through the Aviva Community Fund, Canada's longest running online community funding competition. Since its inception in 2009, the Aviva Community Fund has awarded $7.5 million to over 250 charities and community groups nationwide. Aviva Canada, bringing over 300 years of good thinking and insurance solutions to Canadians from coast-to-coast. For more information visit avivacanada.com, the company's blog or Twitter, Facebook and LinkedIn pages.